Just like with a turbo upgrade, you can’t expect to bolt on new suspension hardware and realize gains right out of the gate. Obtaining peak performance requires adjustments, tuning and an understanding of how the pieces work in conjunction with each other. Perfecting a suspension system is a daunting task, as it is arguably the most complicated system of any performance vehicle. 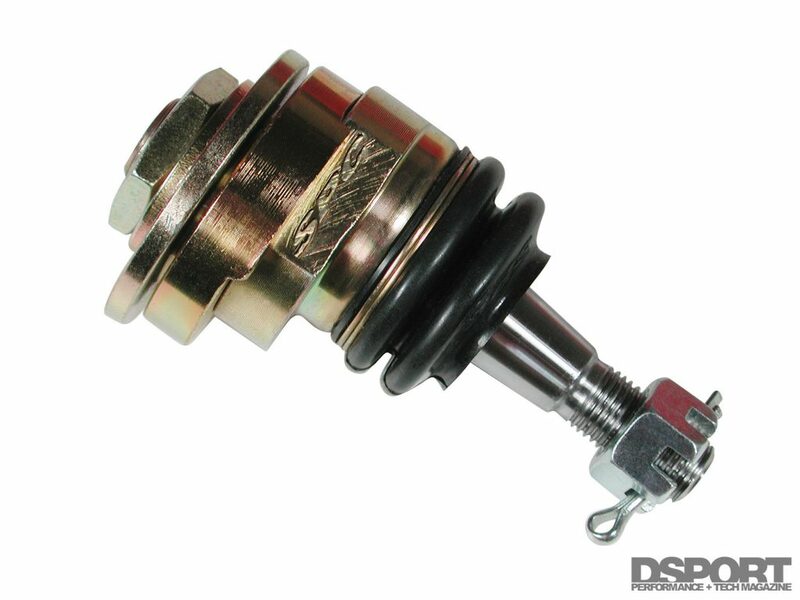 Most typically focus on stiffer dampers, springs and sway bars when upgrading the suspension. Although these upgrades usually improve handling, the effectiveness of the system also depends on the lengths, angles and linking points of the suspension system. 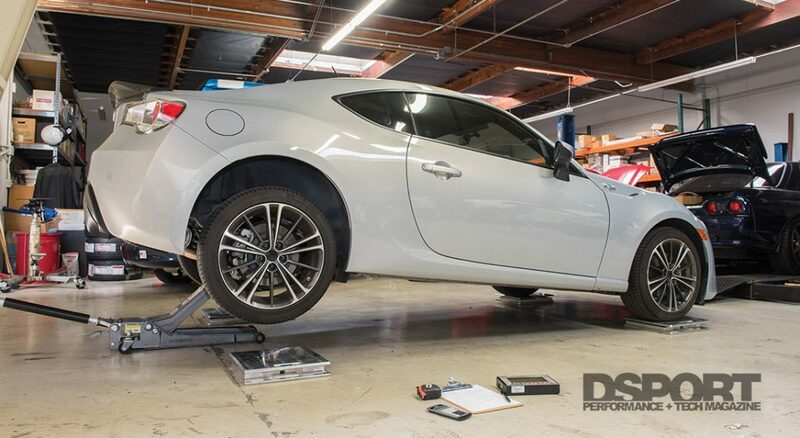 In this suspension tech feature, we’ll examine roll center, center of gravity, and wheel alignments in relation to improved handling performance. From street performance to even some upper levels of racing, there are still far too many examples of monkey see, monkey do. Let’s clear up a few misconceptions. Lowering your car, adding negative camber, installing stiffer springs, installing thicker sway bars or stiffening damper valving does not inherently improve handling. Different vehicle chassis and suspension setups call for different adjustments. For example, a Formula One car’s five degrees of front negative camber works very well for that car’s suspension geometries and stiffness. 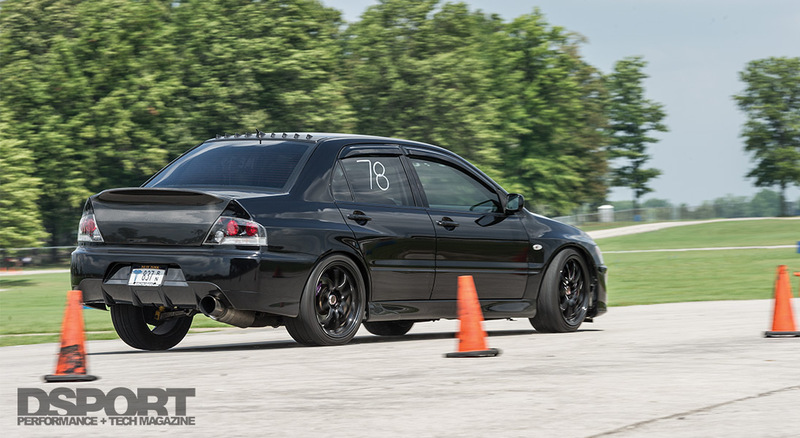 The same five degrees of camber on any street car only makes its handling worse. 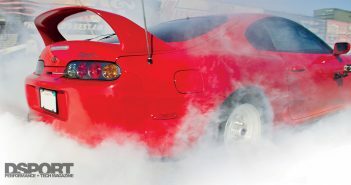 Before making tweaks to your car’s suspension setup, you should first know how the changes affect the car’s chassis, weight jacking and alignment. Why does the car understeer or oversteer? If the problem is rooted in changing camber angles as the body rolls, adjustments to the damper valving only cures symptoms as opposed to solving the problem. 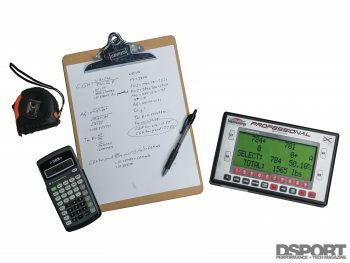 So before you start throwing parts and setup changes at your car, take a step back and analyze the problem and what components directly affect the cause. Many of these handling characteristics are first determined by the suspension geometry, and how it relates to the car’s roll center and center of gravity. Many suspension upgrades are sold on the basis of reducing body roll, however, you should also take into account a few other items. 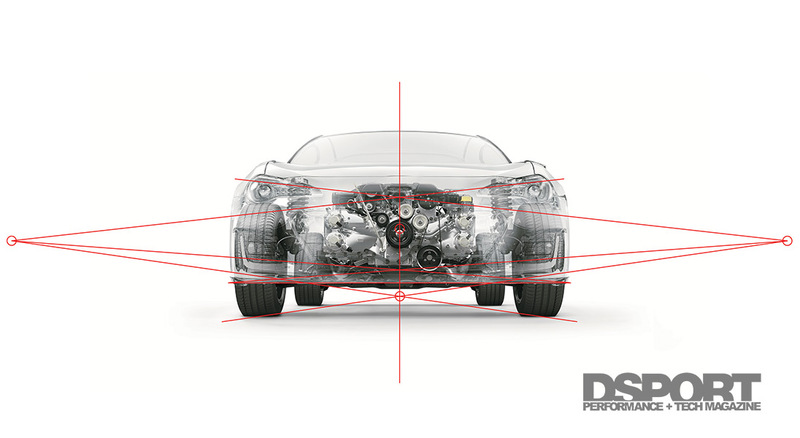 The suspension geometry determines the roll center and center of gravity. The roll center is the point at which the car rolls side to side, affecting how weight shifts through the suspension. There is a roll center at the front of the car and one at the back of the car, creating a roll axis between the two roll centers. Keep in mind that the roll center only affects the direction of weight transfer, but not how much weight is transferred. In our examples, we’re interested in the car’s handling characteristics from side to side, so we’ll determine the locations of the roll center and center of gravity as if we’re looking at the car head-on. You can determine the roll center by drawing three straight lines. First, draw two straight lines overlapping the upper and lower suspension links of one side of the car to the opposite side until the two lines meet. On a strut suspension configuration, the upper line follows the angle of the top of the strut. Then draw a third line from the starting side’s bottom center of the tire contact patch, straight to where the previous two lines met (this point where the three lines meet is known as the instant center). 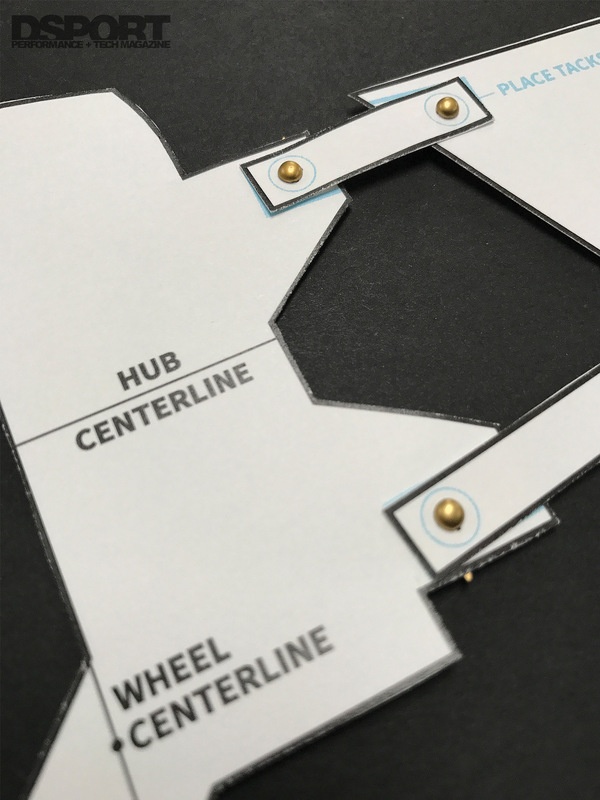 If you draw these lines out for both sides of the car, the roll center resides where both of the contact patch to instant center lines intersect (if the links are parallel and the lines never meet, the roll center is considered to sit at ground level). Since the suspension arms change their angles as the car brakes, accelerates, and corners, the instant centers for either side will change and thus so will the roll center. Most engineers try to keep the roll center from moving more than three inches in any direction, as anything outside of this leads to unwanted handling characteristics. Center of gravity is easier to understand, but a little more difficult to physically calculate. The vertical center of gravity is the height at which the car’s mass is concentrated. Unlike the roll center, shifting the center of gravity higher or lower does change how much weight is transferred under acceleration, braking or cornering. A school bus holds an especially high center of gravity while a go kart’s center of gravity is very low. 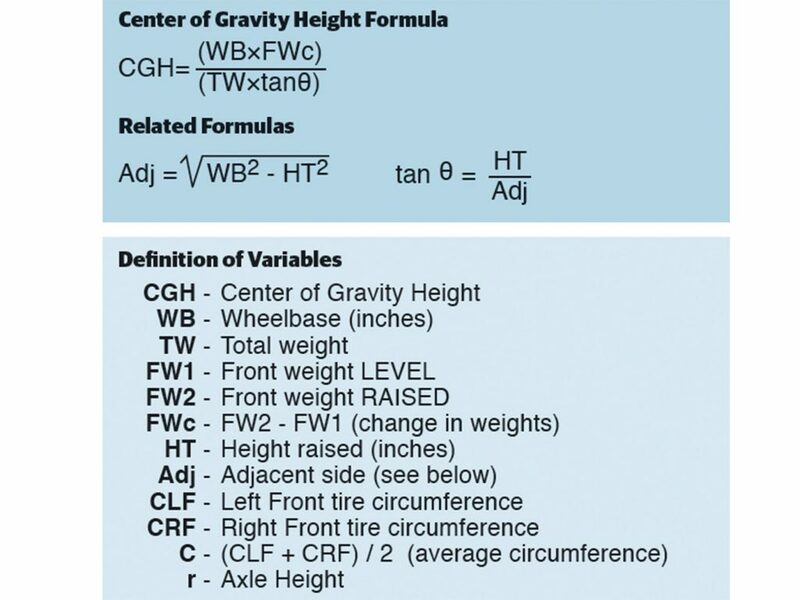 A few websites, including Longacre’s online Tech Library, offer a very useful calculator for determining your exact center of gravity height. First, you must weigh the car on a level surface, then raise the car at least 10 inches at the rear and then weigh the front end. You can then use the equations on this page, or plug the numbers into one of the online calculators. Everyone talks about body roll, but rarely do they dig into its root causes that are roll center and center of gravity. These two elements work together to help or hurt a car’s handling and weight transfer. The farther the center of gravity is from the roll center, the more the car’s body rolls in corners. Think of swinging a mallet or a hammer, where your hand acts as the roll center and the center of gravity sits close to or even on the head. The further the head (and center of gravity) sits away from your hand at the handle (roll center), the harder it is to swing and to stop swinging. As the center of gravity and roll center get closer to each other, the mass of the car has less leverage to resist a change in motion, improving responsiveness. However, you do not want roll center and center of gravity to exist at the exact same point, as this removes body roll completely as well as its ability to transfer weight. For our examples, we’ll refer to a double wishbone configuration. These examples show different suspension arm lengths and angles, and how they affect camber when the chassis rolls side to side. What we’ve discussed so far only affects a static car and does not consider alignment changes. A problem that many cars face in stock trim or are made worse when modified, is unwanted alignment changes when driving through a corner. An ideal setup maintains the largest tire footprint possible, while the wheels remain vertical to the track surface throughout the duration of a corner. Unfortunately, perfecting camber changes is very difficult unless you’re redesigning your entire suspension system. 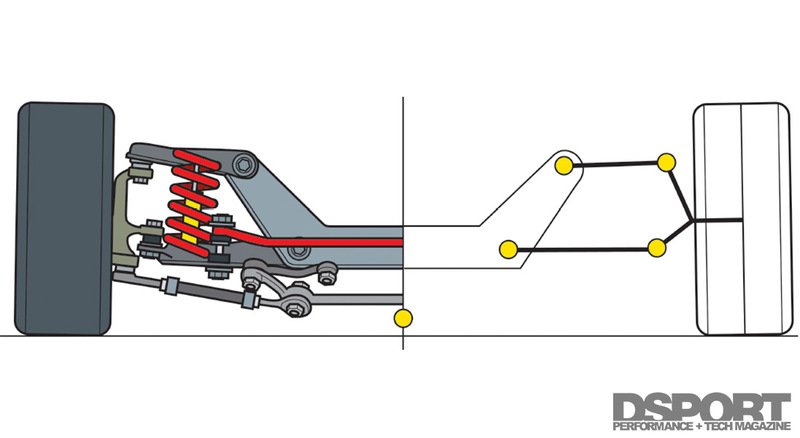 The lengths of the upper and lower suspension links affect a car’s performance as the chassis rolls or as the suspension compresses and rebounds. If these links were equal length and parallel, chassis roll would cause the inside wheel to camber in negatively and the outside wheel to produce unwanted positive camber by the same amount. 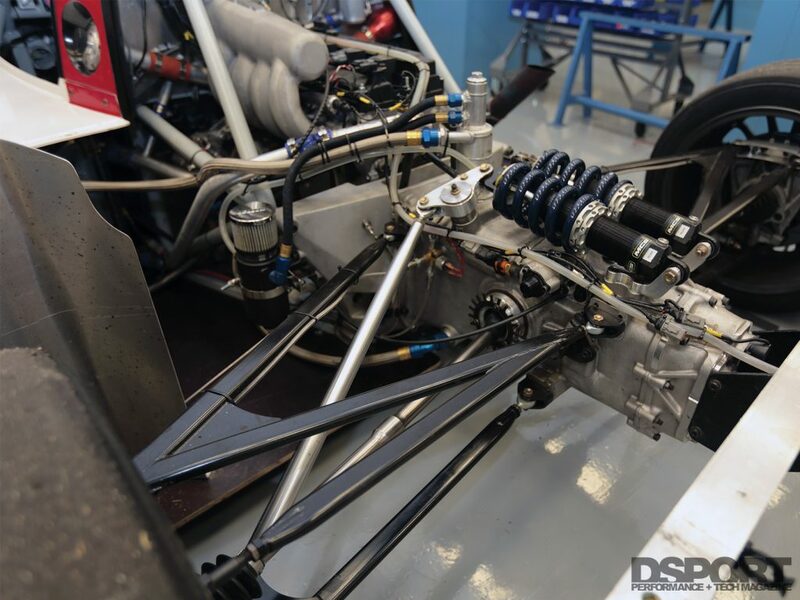 This setup is very detrimental to performance, so most road car and race car designs utilize a parallelogram shape on the chassis for the suspension to link to. The parallelogram chassis configuration makes for a longer bottom link and shorter upper link. In this case, the upper link has a shorter movement radius than the lower link moving up and down. This adds negative camber as the body sinks or as the wheels move upward. As you shorten the upper link or lengthen the bottom link, the camber change curve becomes more aggressive. When the links in this configuration are parallel, the outside wheel sees less positive camber shift but the inside wheel experiences excessive negative camber. 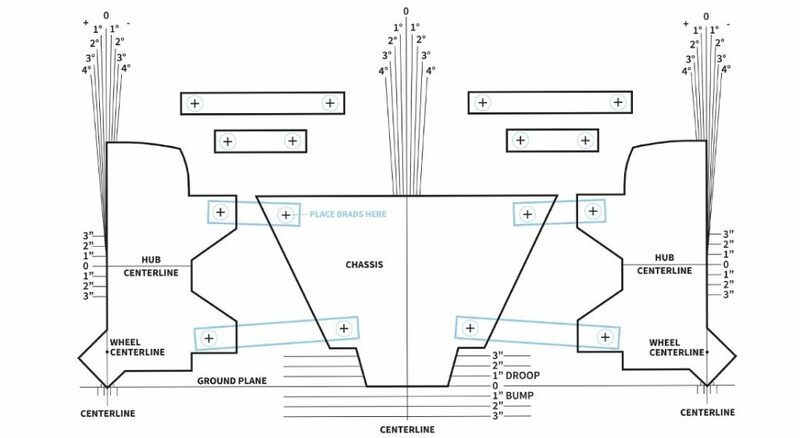 Utilizing unequal length links that are non-parallel improve camber conditions further, however, introducing bump during a body roll has a much greater negative effect due to the sharp angle it demands out of the upper link. Like many setup factors in performance, there are plenty of tradeoffs to consider. Different suspension geometries come with their share of pros and cons, also determined by tires, chassis, track surface and other fine details. 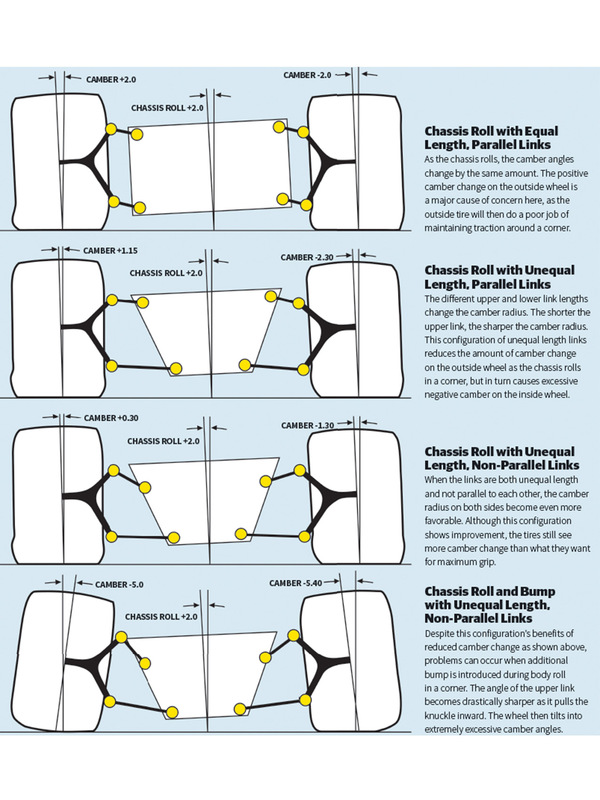 Given that most production cars come with an established, difficult-to-change suspension geometry, this information is useful to most more as a reference to understand the camber curves more than to actually try and change them. How does all of this add up for your car’s setup? 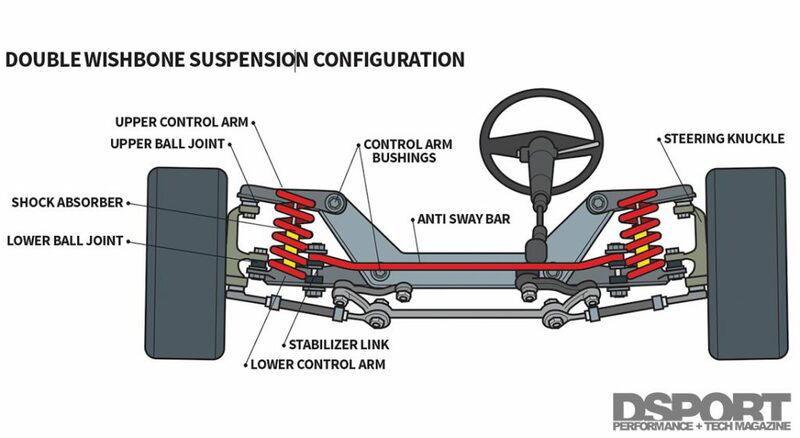 If you’ve seen an IndyCar or Formula One car, you’ve probably noticed that they use very long suspension arms relative to any production road car. The longer arms increase the radius of the wheel’s camber curve, reducing camber change when the body rolls or when the suspension compresses. 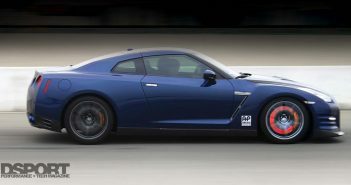 We don’t get these special features or the freedom to make big adjustments to suspension arm lengths and angles on road cars, so we look elsewhere to make improvements. Most of your focus will likely be on perfecting the car’s roll center and center of gravity, with consideration of how the suspension geometry will respond. Many suspension engineering books and references offer a suspension geometry template to cut out and piece together. Print the diagram above on heavy card stock. Then cut out the pieces and pin them together to visualize how exactly body roll, bump and rebound affect camber angles. Your goals in setting up these items should be to lower the center of gravity as much as possible, then bring the roll center close to and underneath the center of gravity. This minimizes body roll while still allowing weight jacking to occur and the suspension to do its job. In turn, excessively lowering your car drops the roll center unfavorably low. In order to correct this, you want to make corrections to the suspension pivot points. Ball joint spacers or taller ball joints are a simple solution to bringing these points to the ideal location. 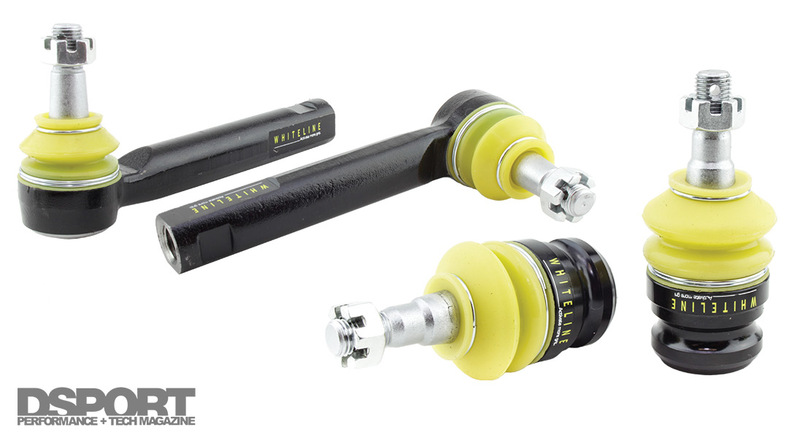 SPC Performance offers adjustable ball joints specific to numerous applications, while Whiteline also offers roll center kits for multiple platforms like the WRX. These sorts of adjustments are a necessity for correcting the suspension geometry when making significant changes to the car’s height. The roll center at the front of the car sits lower than the roll center at the rear, creating a downward sloping roll axis. Pay mind to your setup changes, as adjustments to either end of the car will always affect the other. 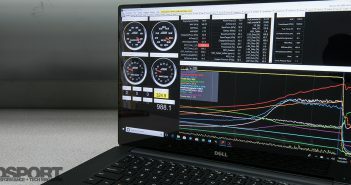 A lower front roll center allows for more throttle steering and smoother weight transfer but hurts responsiveness, while a higher front roll center makes the car more responsive. A lower rear roll center provides more rear grip and grip when on the throttle, at the sacrifice of less traction under braking. A higher rear roll center, however, improves response but also makes the car more of a handful to drive. As with any other tuning component, each car demands a specific balance between these characteristics. An ideal setup reduces slow and excessive body roll, but still allows enough for weight to transfer quickly and effectively in corners. The suspension system is arguably the most complex component of any car. While we covered the basics of suspension geometries, roll centers and center of gravity, there are still plenty of other factors to take into consideration with these items known. When diagnosing an unwanted handling characteristic, you must put together the chain of events that occur throughout the suspension. Springs, dampers, sway bars, chassis braces and tires each have an effect on each other and must be considered when tuning. There are many ways to tune a car to match your driving style and optimize handling, and there are just as many ways to screw it up. The key to getting the setup just right is to make one change at a time and keep on testing ideas.